From the Royal Wedding to the World Cup, there has been a lot going on lately. However, perhaps the most important event of all is World Rainforest Day which has been launched by Rainforest Partnership in order to raise awareness of the importance and preciousness of our rainforests, and inspire people to protect them. Click here to help protect the rainforests. Often described as the “lungs of the earth”, the world’s rainforests are not only breathtakingly beautiful but massively important to the health of our planet. They are responsible for circulating 20% of the world’s oxygen, as well as absorbing and storing all the lethal carbon dioxide that floats in our air. Furthermore, our rainforests are home to all sorts of creatures great and small. From gorillas to insects, over half the world’s animal and plant species are found in rainforests, making it a buzzing hub of biodiversity that is majorly threatened by deforestation. It is predicted that if the current rate of deforestation continues, there will be no rainforests left on earth in 100 years’ time, and it is thought that 28,000 different species will have become extinct by 2050. As well as shocking and frightening, these figures are also heart-breaking. However, when it comes to our rainforests, all is not lost, as there are several steps that can be taken to protect them. One of the ways we can do this is by reducing our consumption of beef, the production of which is the most damaging cause of deforestation, as almost three million hectares of tropical rainforest are destroyed annually in Latin America to make room for cattle. This leads to more problems as the countless cows emit massive amounts of greenhouse gases. The best way to stop this is by becoming vegetarian, but becoming flexitarian is still a heroic move for the rainforests because by occasionally choosing the bean burger over the beef burger, and giving falafels a whirl, you can greatly reduce your carbon footprint. Another major cause of deforestation is palm oil, which is mostly produced in south-east Asia. Due to growing demand, the number of palm oil plantations have doubled in the past ten years, which is horrific for the environment as it releases 28 times more carbon dioxide than the forests which are so thoughtlessly destroyed in order to build the plantations. Palm oil is unfortunately used in many food items such as peanut butter and crisps as well as certain cleaning products and cosmetics, but products bearing the certified sustainable palm oil logo meet strict criteria for reducing the negative impact of the oil. Thus, by making the effort to check for this logo when you’re doing your weekly shop, you’re making an effort to save the rainforests and all the species inside. Also, if you want to save the rainforest in style, Critically Endangered Socks has the solution. 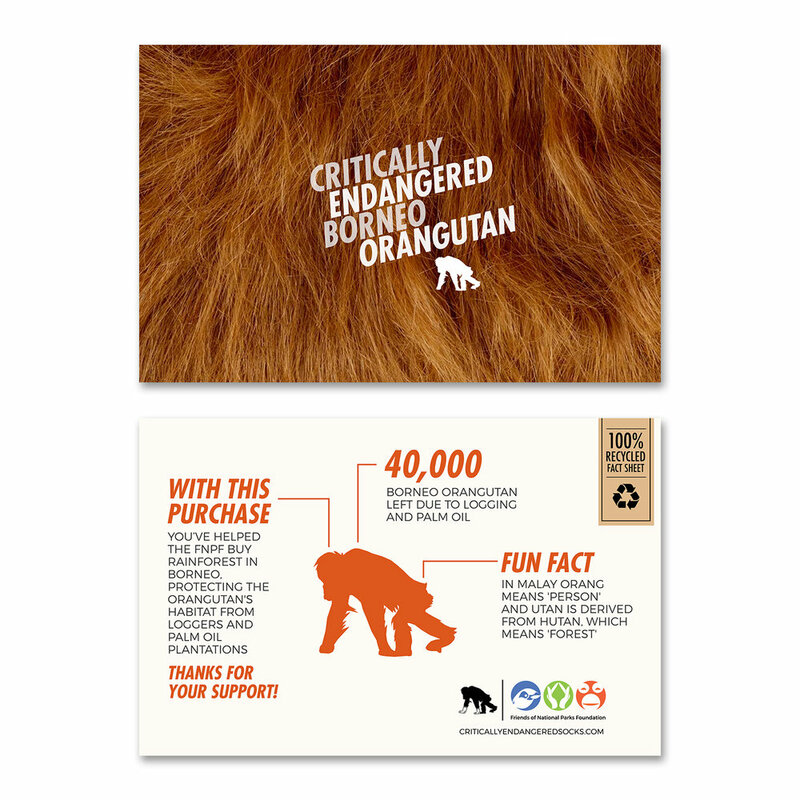 Some of the profits of our beautiful Orangutan sock go towards the Friends of the National Parks Foundation (FNPF), an amazing charity which works to replant areas of the Borneo rainforest which has been destroyed, and thus help protect a number of native animals such as Bornean orangutans and turtles. Every single living organism on this earth relies on the rainforests to survive, so it’s about time we pulled our socks up to protect it and what better way to do this than by buying a pair of these beauties?